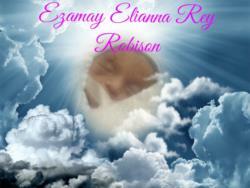 Just hours after coming into the world, Ezamay Elianna Rey Robison, passed away peacefully at Sierra Vista Hospital in Truth or Consequences, NM on Sunday, August 12, 2018. During that fleeting time, she touched many lives and was loved by all who met her. Ezamay is survived by her father and mother, Daniel and Sara Robison; her brother, Mishra Urza Tien Robison; and her grandmother, Paula Robison. A Memorial Service will take place in the Chapel at Kirikos Family Funeral Home on Saturday, September 15, 2018 at 2:00 P.M.
Perhaps they are not stars in the night sky, but rather lights from heaven were our loved ones look down and let us know they are with us, always.